I’m not a great fan of the Lucie Awards for photography, modelled on the Oscars, which seem to me to bring out the worst of Hollywood, although I’ve never attended the awards ceremony. When they began and I was writing as About Photography guide I used to get invitations to them – and offers of free tickets – but never took these up, partly because I was on the wrong side of the Atlantic. Also because I felt that the last thing that photography needed was something like this, and particularly one that seemed so entirely US-centric. Part of my mission as a guide was top extend the horizons and to try to promote photography as a worldwide medium. I’m not sure how much my meagre efforts helped, with features on photography in countries around the world and on photographers from other countries than the USA and Western Europe, but things have now changed at least to some extent. One of the many I wrote about was of course Shahidul Alam, and I’ve written about him on several occasions on this site, most recently following his arrest last August at his home in Bangladesh and the international outcry, particularly by photographers this led to. Of course he is much more than a photographer, setting up agencies to promote majority world photograph, photographic schools and festivals and making photography relevant to the politics of Bangladesh. 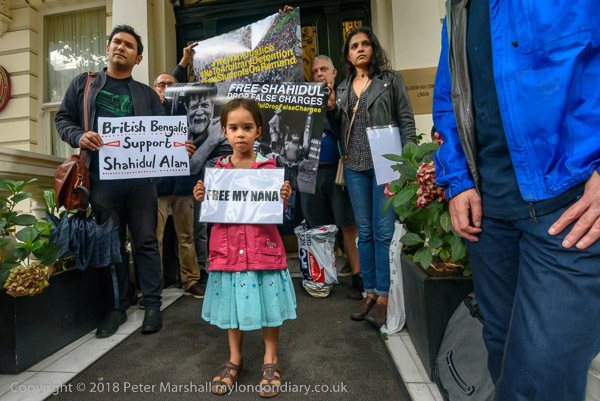 Shahidul Alam was – as I’ve previously mentioned – honoured at the 16th Lucie Awards in October 2018 with their Humanitarian Award, and now that he is out of prison (though not out of trouble, still under threat of a trial and lengthy sentence) publishing regular posts on Shahidul News. One recent post was about his Lucie Award and was a link to the video they produced on him for this. I suggest you watch it full-screen, and you can go direct to it on Vimeo. While you are there you can also watch other short videos on the other honorees, including Lee Friedlander who gained the Lifetime Award and Raghu Rai, along with those from previous years. Also at Shahidul News is a post reproduced from PIX by Rahaab Allana, The Place of Shahidul Alam, which looks in more detail at some of his acheivements and has a number of comments by others. You can read a longer piece I wrote about him in 2011 on this site at From the Lions Point Of View. This entry was posted on Wednesday, January 30th, 2019 at 03:36 pm and is filed under Photo History, Photographers, Political Issues. You can follow any responses to this entry through the RSS 2.0 feed. You can leave a response, or trackback from your own site.